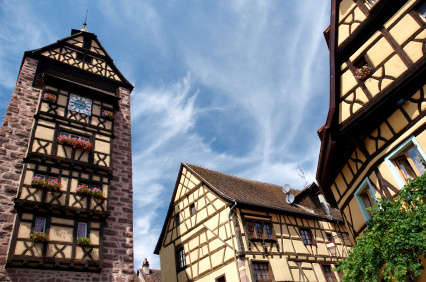 Riquewihr's dolder, medieval tower, and half-timbered houses. Blessed with a unique blend of Germany and France, Alsace is a pictureque strip of land hemmed by the Rhine River and the Vosges Mountains. Beyond its geranium-filled windows and storks nesting on top of timber-framed houses is a hedonistic hybrid culture of food lovers. 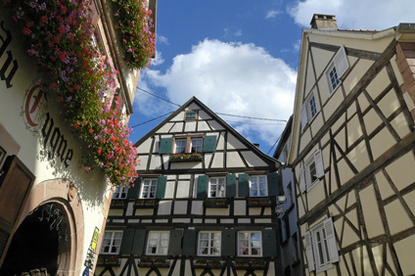 Alsace produces both high-quality wine and beer. 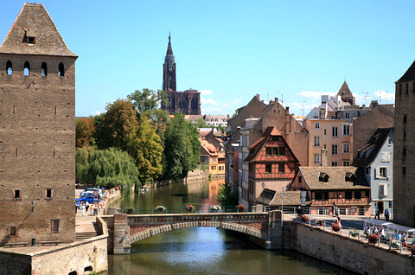 Its cuisine unabashedly combines foie gras and sauerkraut, macarons and gingerbread... Colmar and Strasbourg both rank among the 10 best cities to eat in France. 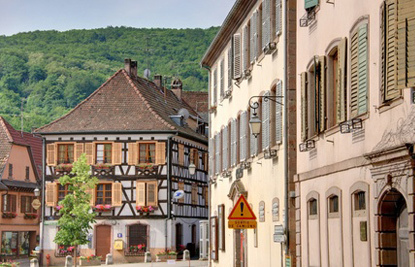 Alsace is the smallest French region (excluding overseas regions), the third most densely populated, the fourth wealthiest, as well as the one with the lowest unemployment rate. Although German dialects were spoken in Alsace for most of its history, the dominant language in Alsace today is French. The traditional Alsatian language is an Alemannic dialect of Upper German and thus closely related to Swiss German and Swabian. Famous people from Alsace include (chronologically): Nobel Peace Prize philosopher Albert Schweitzer, Nobel-prize-winning chemist Jean-Marie Lehn, pastry chef Pierre Hermé, rally driver Sébastien Loeb. Alsace has been settled by Germanic people ever since the latter days of the Roman Empire. In the Middle Ages, it was one of the favourite residences of many Holy Roman Emperors, who granted the special status of Free Imperial City to ten Alsatian towns, who later form the Décapole alliance (or Zehnstädtebund in German). While the Thirty Years' War (1618-1648) ravaged a religiously divided Germany, Louis XIV opportunistically annexed Alsace. Many cities resisted this forceful annexation for up to three decades, before resigning themselves after witnessing their homes being plundered and burned by the French. No sooner had the Alsatians got used to French rule that they were retroceded to Germany in 1871 following the Franco-Prussian War. 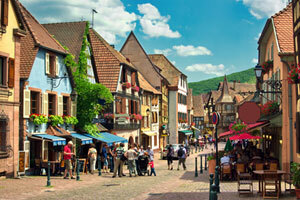 Alsace remained German until the end of WWI, was returned to France, then recovered again by the Germans during WWII. 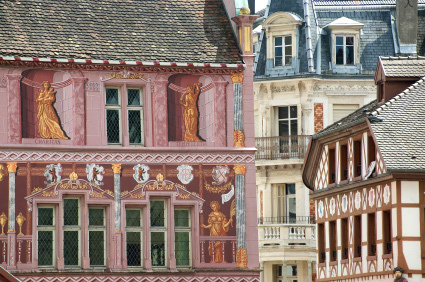 One of France's most impressive timber-framed city, home to the celebrated Unterlinden Museum. A lovely, perfectly preserved timber-framed village. Kaysersberg is a gorgeous fortified village on the Alsatian wine route. 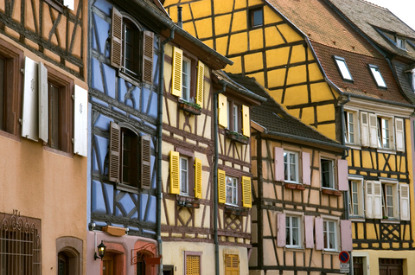 Possibly Alsace's most gorgeous town, Riquewihr has long been renowned for its white wine. Once an independent republic, Mulhouse propelled France into the Industrial age and is now home to the world's largest car museum and train museum. 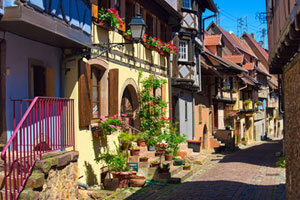 An Alsatian Renaissance town in pristine condition, just 25 km from Strasbourg. 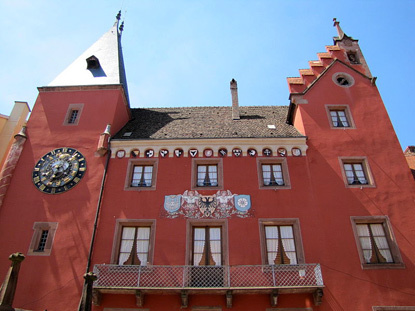 Former seat of the Alsatian League, Haguenau is has retained a few grand Renaissance edifices. 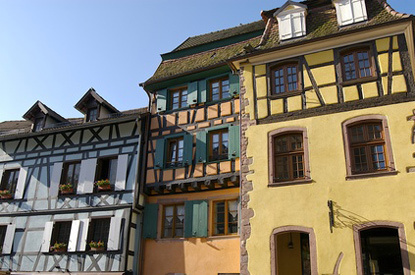 Sitting on the Franco-German border, Wissembourg is renowned for its late Medieval and Renaissance architecture. 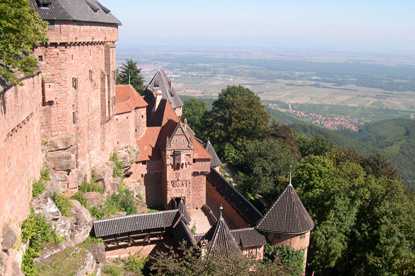 Overlooking the vineyards of Alsace, Haut-Koenigsbourg Castle is red-sandstone fortress dating back to the 12th century and reconstructed by Kaiser Wilhelm II in the early 1900's.